Captain Brian D. Rizzoli and First Lieutenant William B. Satterly, of the 47th Airlift Wing, died when their C-21 crashed near Ellsworth Air Force Base, South Dakota. The C-21 is the military version of the Learjet 35A. U.S. AIR FORCE ACADEMY, Colorado – Memorial (educational) funds have been established for the children of two victims of a recent aircraft crash in South Dakota. 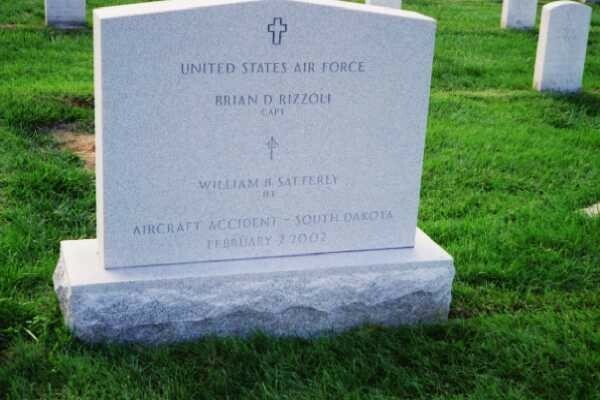 The Captain Brian D. Rizzoli and First Lieutenant William B. Satterly Memorial Funds are in memory of Rizzoli, a 1996 Academy graduate, and Satterly, who were killed February 5, 2002, when their C-21 jet crashed during a training mission near Ellsworth Air Force Base, South Dakota. The two crewmembers were assigned to the 47th Airlift Flight based at Wright Patterson AFB, Ohio. There were no passengers on the aircraft. WRIGHT-PATTERSON AIR FORCE BASE, Ohio (AFPN) -- Two airmen assigned here died February 2, 2002, when their aircraft crashed near Ellsworth Air Force Base, South Dakota. Captain Brian D. Rizzoli and First Lieutenant William B. Satterly died when their C-21 crashed about 5:15 p.m. EST during a training mission. The crew and aircraft belong to the 47th Airlift Flight here. Its parent unit is the 375th Airlift Wing at Scott AFB, Illinois. The C-21 is used for cargo and passenger airlift. It is the military version of the Learjet 35A business jet. It can carry eight passengers and has a crew of two. A small military cargo and passenger plane crashed in a field outside Ellsworth Air Force Base after missing houses, and both airmen on board were killed. Their twin-engine C-21, a military version of a Learjet business aircraft, was based at Wright-Patterson Air Force Base, Ohio. The cause of the crash Saturday was not yet determined, Air Force officials said Sunday. No one on the ground was injured. Air Force officials identified the victims as Captain Brian D. Rizzoli and First Lieutenant William B. Satterly. The crew and the aircraft belonged to the 47th Airlift Flight.